Tissu simultané no. 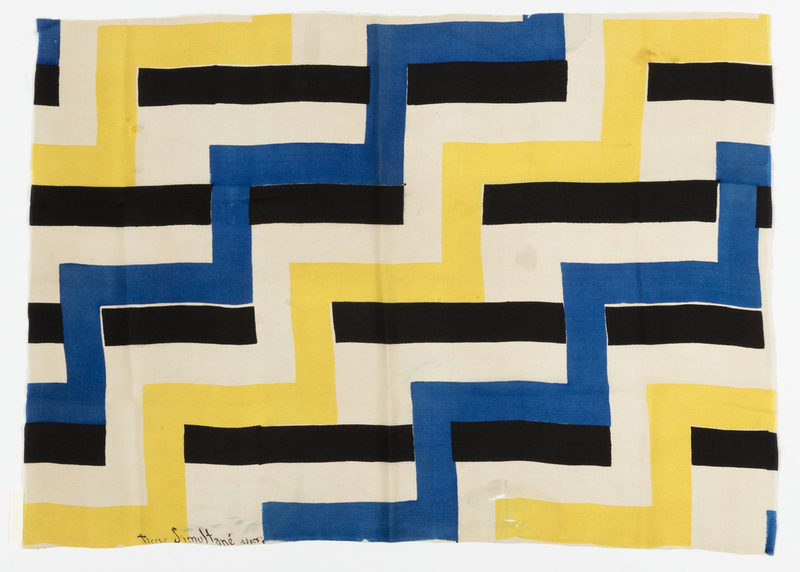 46, a bold geometric design of blue, yellow, and black lines on a white ground, has the hallmark characteristics of Sonia Delaunay’s textiles from the 1920s: contrasting colors with abstract, geometric, or rounded patterns that are block-printed on cotton or silk fabric. In fact, she often printed the same pattern and colorway on different types of fabrics to achieve very different effects. Although this same pattern has been printed on other textiles, such as cotton, that absorb more of the color, this example is silk and the color sits on the surface for a more vibrant and painterly effect. Delaunay made a distinction between her paintings and textiles, but tried to capture the immediacy of the creative process in both. In the early 1920s, she initially carved her own wood blocks in order to reveal particular subtleties. Only later, when she became too busy to carve the blocks herself, did she instead supervise the process. Although Delaunay ultimately returned to painting after the 1930s, she always saw textiles and painting as equals. I love these “Object’s of the day!” I saw a Sonia Delaunay exhibit in Paris a few years ago. So nice to see another one of her creative designs. Thank you.